Since focusing my work on restorative and cosmetic dentistry I have improved, rehabilitated and in many instances completely changed many people's smiles. I use the word 'smiles' rather than teeth because the ability to smile for these people did not always come naturally. For me the success of any restorative and cosmetic treatment that I do results in the creation of the desired affect for my patients from a physical and psychological aspect. Over the years I have got to know many of my patients very well and they have shared their stories with me.It gives me the greatest pleasure when someone walks into my surgery after completion of dental treatment, beaming from ear to ear. Their demeanour, the way they walk and talk usually has changed due to their new found confidence and improved inner well-being. I know that this kind of dental treatment can improve people's lives; I have witnessed it first-hand. I would like to share a few of my patient's stories. 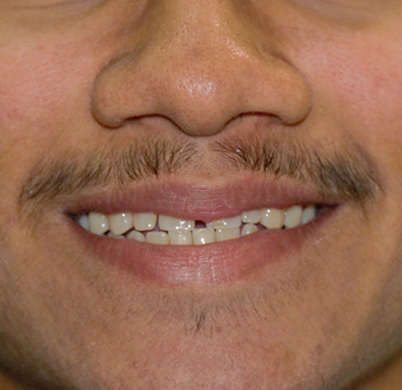 Mr.Harsh , a 17 year old young boy had recently joined college and was very conscious about his smile as there were gaps in the front tooth. He wanted to know if his gap could be closed. After having discussions and detailed photographs taken we had advised Mr.Harsh to have E-max Laminates in his front teeth. In total 6 tooth were treated. The difficulty in this treatment was to make sure the laminates on the front teeth is to close the gap in an esthetic way. This was crucial in achieving a natural smile as the gap was more than 2-4mm. Dental laminates are wafer-thin, custom-made shells of tooth-colored materials designed to cover the front surface of teeth to improve your appearance. These shells are bonded to the front of the teeth changing their color, shape, size, or length. The entire treatment from start to finish took place over a period of 3 weeks.